Decaffeinated Tea is really nice for tea lovers, who want to avoid caffeine. The most popular forms of tea i.e. black tea and green tea can be decaffeinated. The process of decaffeination though leaves a little caffeine in the leaves. There are four methods to get decaffeinated tea. • Methylene Chloride treatment – The tea leaves are soaked in water with traces of Methylene Chloride. Methylene Chloride removes caffeine by bonding with the molecules. However this chemical is not deemed to be healthy and its use in decaffeination has been mostly discontinued. • Natural Decaffeination – Processing the tea leaves with ethyl acetate is termed as natural decaffeination. The reason for the nomenclature is because ethyl acetate is naturally found in tea. However most of the tea is not decaffeinated this way, as it is almost impossible to remove the chemical. • Carbon Dioxide treatment – Cooking with high pressured Carbon Dioxide is the best process for decaffeination. The gas removes the caffeine from leaves at molecular level, keeping the natural flavour intact. This method is also known as organic decaffeination. • The coffee method – Using water extraction is a common method for coffee decaffeination. Some amounts of tea decaffeination uses this method, where the leaves are soaked in hot water and then passed through carbon filter to remove caffeine. Milk tea is a variety which is popular in Asia and particularly famous in Hong Kong. It is made from black tea and milk. It is an important part of Hong Kong Lunch. It has become a custom to offer milk tea to guests also. To start with tea(Black tea 2 teaspoons generally) and water are boiled . Then it is left to simmer for 5 minutes. The boil intensifies the caffeine content of the mixture. Then the mixture is strained using sack cloth bag. The straining gives a rich brown color to the tea and it is the speciality of Hong Kong tea. The milk is added and stirred to give the creamy look. Generally milk is added at last but there are alternative methods also. Another way is to boil milk and water together and then add the tea. This gives tea a much creamier taste. However both the methods are acceptable ways of making Hong Kong milk tea. How do the Hong Kong people test the quality of the milk tea? Well it is the smoothness of the tea which means how creamy it feels. Another way to test is the froth formation at the top. White froth means there is butter fat in the tea. Hing Kongers love this variety. Another variety is the iced tea which has come along. However the making is not like the normal cold coffee. Ice is not added to the tea. Instead tea is prepared in the normal Hong Kong style and then cooled in an ice-bucket. This means the tea is not diluted. Different method of preparation isn’t it? What can be a special gift for a tea lover in your life this Christmas? Yes, it’s the finest collection of teas or the best of tea accessory. Make the drinking experience feel like an art form and not just a daily activity. Royal English Tea Tower: This elegant gift box has an assortment of world’s finest teas- a delight to the most diligent of tea drinkers. It is combined with porcelain accoutrements and tea-themed treats. Assorted Handcrafted Teas: If your friend likes to try out different flavors, this is the finest gift of all times. It has a a unique combination of different flavours like Chinese tea, Darjeeling, fruit tea and more, all into one box. Tea for Two: It is another cute set of kettle and two cups for an enjoyable and memorable drinking experience. Not just a cat-faced kettle, get even rabbit-faced or long-nose Pinocchio faced kettles. Brew Control Glass Teapot: It is a perfect gift for a tea enthusiast. It comes from an idea of a classical strainer and modernised to make a great tea accessory. One can use for both tea bags and tea leaves. Cute Tea Spoons: No tea is complete without a teaspoon. Gift funky and colorful tea spoons so that the tea-lover friend always remember you while drinking his favourite beverage. Colour Changing Kettle: This intelligent set of kettle keeps its user informed about the entire course of water boiling by changing the color to luminous red. Like, green tea requires less hot water (from 150 to 160 degree fahrenheit) to retain its qualities whereas white and black tea needs boiling water to unleash its qualities. These are a few fun-filled and cool gift ideas for all those Brits like us who have deep love affair with tea since ages. Pick any of these uniquely designed tea accessories with finest tea leaves to make your Christmas gift delightful. If you are ever in Bath, UK, you should certainly make your way towards Sally Lunn, one of the most prestigious tea houses in the country. The British do appreciate their tea, and places like Sally Lunn show exactly why. It’s located in the oldest house in Bath (built in 1482), and has been a tea house for more than 3 centuries now. The place has been serving tea to the locals for about 400 years, and that is quite a miraculous thought. 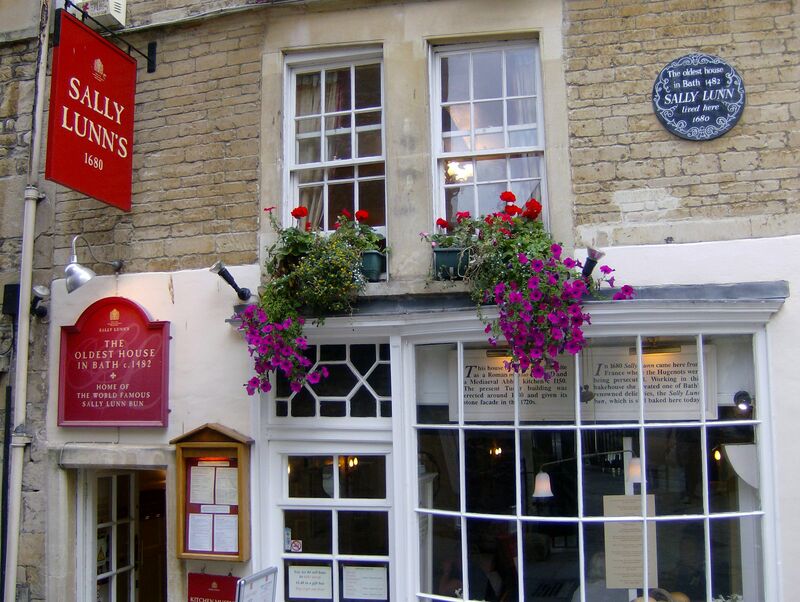 Sally Lunn is most famous for discovering the Sally Lunn Bun– one of the most delicious accompaniments to tea, ever. The Sally Lun Bun is also known as a Bath Bun, but the word ‘bun’ does not accurately depict its’ taste. It’s also part bread, and part cake. It’s a generously sized bun that is also surprisingly light. It was created by Sally Lunn, a Huguenot baker (and the person the tea house is named after). What is most enjoyable about this place is the fact that the tea house has been doing the exact same thing for centuries- people have been coming to this spot, for the same tea, and the same bun for about 400 years and that is just absolutely mindblowing to imagine! If you want to get real organic tea and have a taste of it, then you should grow it in your kitchen garden. Yes dear it can be grown right there. Well I am talking about herbs which taste like tea and can be very beneficial for your health. Here are a few herbs which you will really enjoy growing and the brewing as tea. Lemon Grass – You can grow this aromatic herb in a flower-pot. It really grows well where there is water. Water the plant carefully. Pluck the grass like leaves to boil and make a nice smelling herbal tea preparation. Lemon Balm – This is from the mint family and has strong lemon and mint flavor. It is also known as the happy herb as it takes away your stress. It helps even in common cold and cough. A brewed tea from the leaves will help in getting over a hangover as well. Many benefits of a herb that grows naturally in shallow soil. The only care you need to take is to not put much water or expose it to direct sunlight. Grow it in a plastic jar away from exposed area. Mint – The great minty flavor they call it. Tea made from mint has the property of regularize your digestion. A cup daily will also keep common cold away. Yes I did not have cold for four years since I have started drinking mint tea every morning. Tea the real one – You need some deep soil and good sun ray coming in. There are fertilizers which will help the shrub grow. Keeping the soil moist always is also necessary. Once they have a dozen leaves start the plucking. You can use directly for green tea. Add some mint for the taste and enjoy!Click on the link to know how do you chose the best!? Tea is one of the oldest drinks and the variety it has will put wine to shame. Drinking tea has some great health benefits attached to it. However you intake this ancient drink you will be benefited. Here are a few benefits of drinking tea. Contains Anti-Oxidants – Tea contains anti-oxidants which will keep your body from ageing. No it will not keep you forever young but will slow the ageing process. Chinese and Japanese people drink the most tea and age very slowly. Reduces risk of heart attack – Tea contains certain chemicals which smooths your arteries and keeps them supple. It also helps in breaking the cholesterol globules. Drinking two to three cups of tea daily reduces risk of heart attack up to seventy percent. Protects your bones – The phytochemicals present in tea helps to increase the bone density resulting in stronger bones. The added milk also adds to the calcium required. However tea is best without adding any additives. Protects teeth – It is not a joke. The dental problems arise due to sugar added to tea. If had without sugar tea actually keeps plaque at bay as it contains fluoride and tannin. Improves immunity – Tea increases the platelet count and helps improve the effectiveness of immune system. It was found in a study that tea drinkers had less chances of catching cold than who were non drinkers. Anti Carcinogenic – Tea contains polyphenols that are effective in fighting off the cancerous tissue. Drinking tea will help you protect against possible cancerous growth. Calorie free and increases metabolism – For getting this benefit you need to drink tea without adding sugar or milk. It will increase your metabolism, improve digestion and is surprisingly calorie-free. It is known that tea has huge health benefits and is one of the oldest drinks in the world. The chinese discovered tea and the British popularised it. There are many interesting facts about tea. Most of the people of the world drink tea in the morning to wake up. Most consumed drink – If you leave out water, then tea is the most consumed drink of the world. It leaves popular drinks like coffee and alcoholic beverages far behind. All varieties come from the same plant – All the varieties of tea originate from the same plant with scientific name Camellia Sinensis. Chinese specialize in production of green tea while the Sri Lankans are specialist of black tea production. Taste of different varieties are due to processing – The different kinds of tea taste different due to their processing style. Black tea is the most oxidised and the green tea the least oxidised. White tea is the fermented version of tea. Herbal tea is not tea – The herbal tea which you get in the market is not tea. It is called tisane and only has flavour like tea. Tasters of tea are specialists – The tea tasters are specialists just like the wine tasters.The tasters look for specific flavours. Only people with sensitivity to flavour can have this amazing job. Lesser the processing better it is for health – Least processed tea is the one which retains the benefits. The purest tea does not taste that good but is a tonic to the whole body. Black tea is more popular than green tea – In spite of the health benefits of green tea black tea is more popular. It started as a preservation process which changed the flavour of green tea. The british colonisation is one of the reasons for tea becoming such a popular drink.